Improves fit behind the waist, which is the part of a wetsuit most prone to separating from the skin, to boost comfort and style. 3D panels are also used under the arms and behind the knees for increased mobility. Smooth skin piping around the neck, which is particularly prone to gaps, helps improve the waterproofness of the seal. In addition, 3D panels are also used on the neck to create a comfortable fit. Silicone knee pads offer improved strength, elasticity, and grip force compared to conventional printed pads. The design of the pads also features the brand logo. Reliable YKK zippers are used throughout the wetsuit. The Velcro fastener around the neck allows you to adjust the fit. 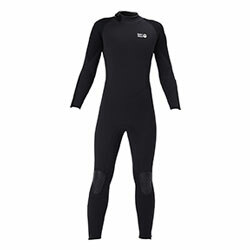 The ankle zippers, which are 2 cm longer than in previous models, make this wetsuit easier to get in and out of and more comfortable to wear on land. The zipper guard on the inside of the zipper stops water intrusion and keeps the zipper from coming into direct contact with your skin.